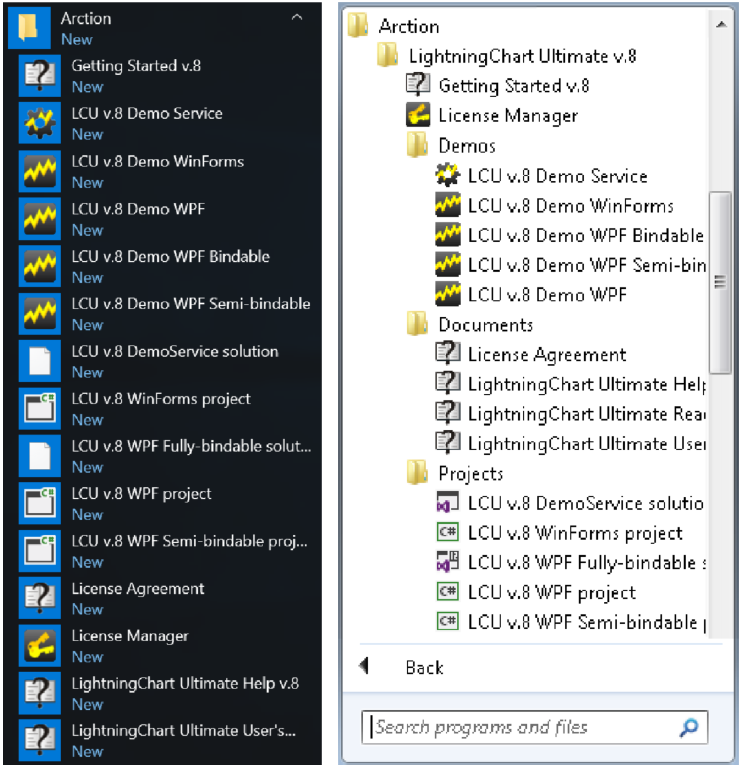 The software installs to C:\Program Files (x86)\Arction\LightningChart Ultimate SDK v.8 by default, and creates C:\ProgramData\Arction\LightningChart Ultimate SDK v.8 folder where the examples are, so they can be compiled from there with regular user rights in Windows. There are four extensive applications, the shortcuts appear in your desktop and in Start menu / Arction. Furthermore, there’s Service Demo for connecting a client application to a service which generates chart image stream. 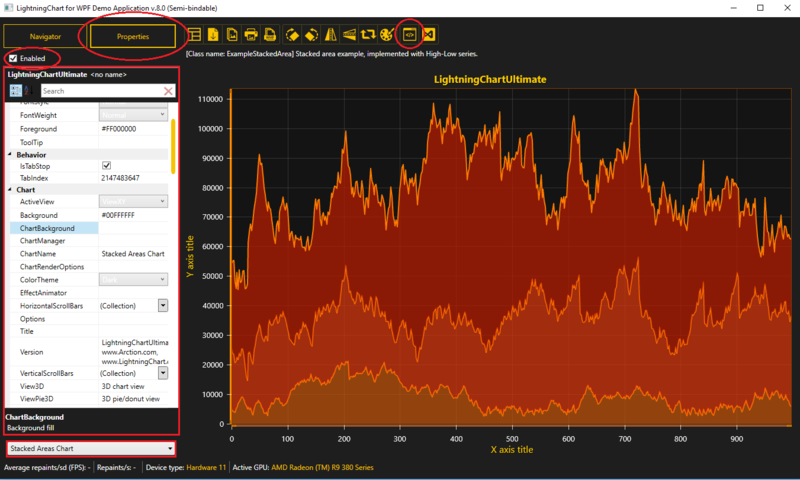 For Service demo (Headless mode rendering, please refer to LightningChart User’s Manual, and DemoService\description.pdf). 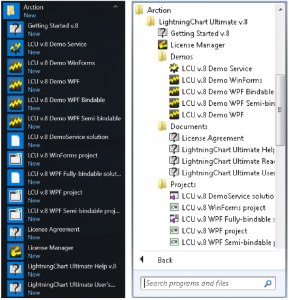 The four main demo applications have a lot of examples grouped in the navigation tree. Go through the examples by using Navigation tree in the Navigator tab. Many examples have a lot of settings in the user interface, feel free to change them. Use Properties tab to view and edit the chart properties. 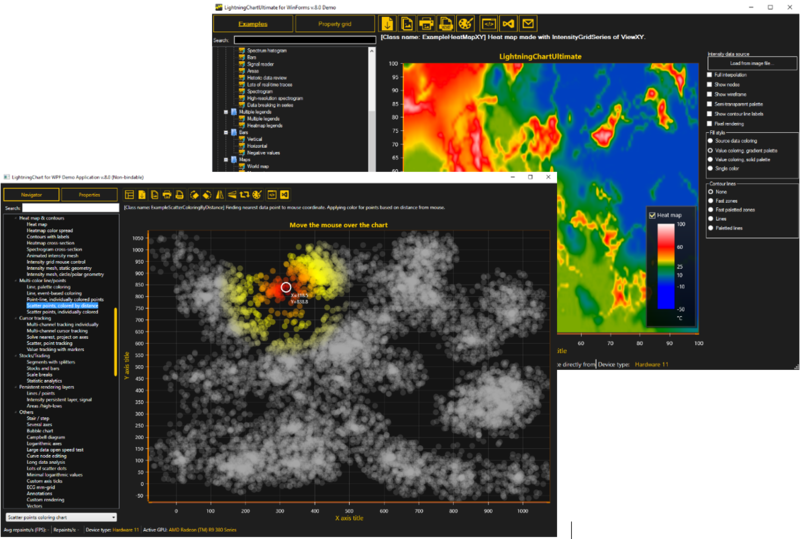 On-the-fly source code display is available in WinForms, Non-Bindable WPF and Semi-bindable WPF demo applications. Press Show source code… button to view the source code of selected example. 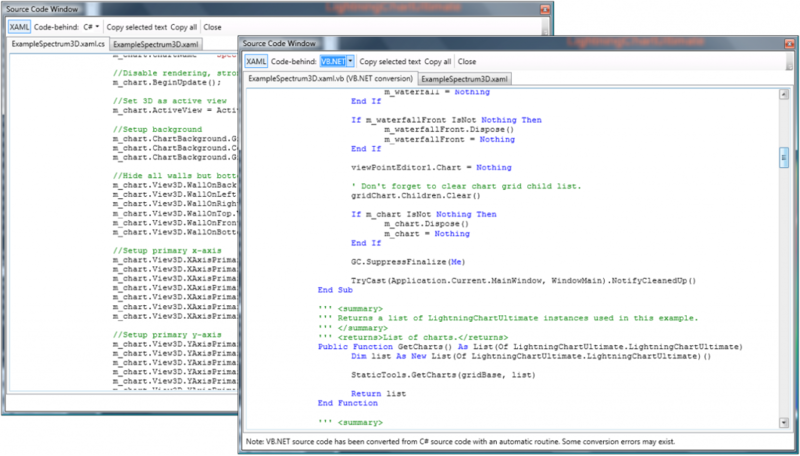 The source code is available as C# and VB.NET (machine-converted). Take 10 minutes to read titles and look at the pictures. That’s time spent well. Get back to this User’s manual document when you are programming. 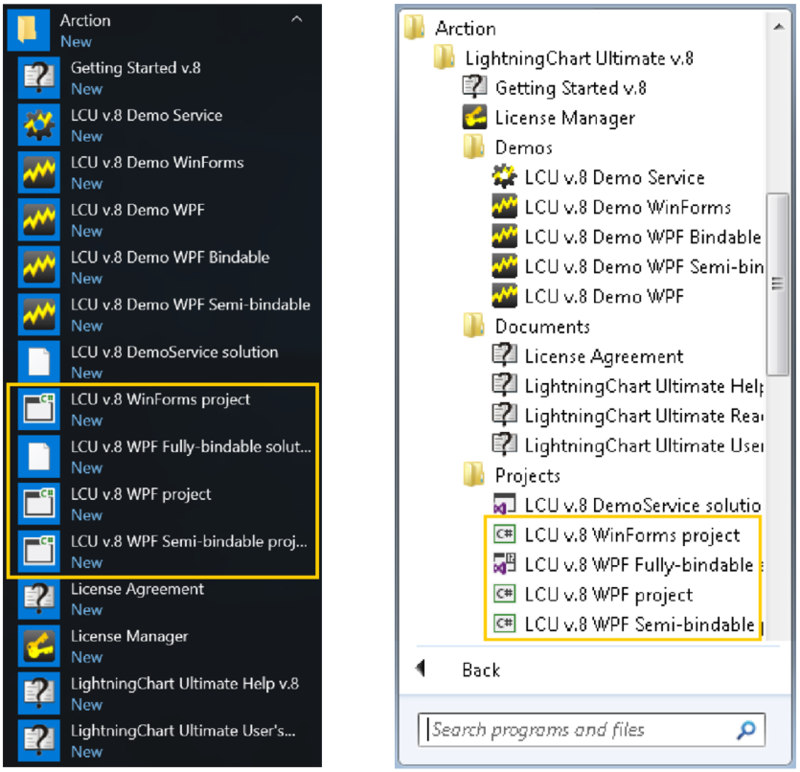 Note LCU .v8 WPF Fully-bindable is a Solution, not project. 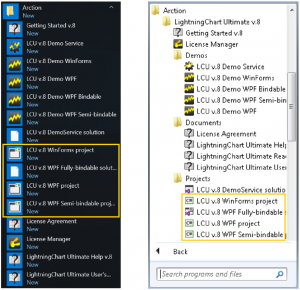 Every example in that is a stand-alone project, and LCU .v8 Demo WPF Bindable executable just browses through these standalone examples. 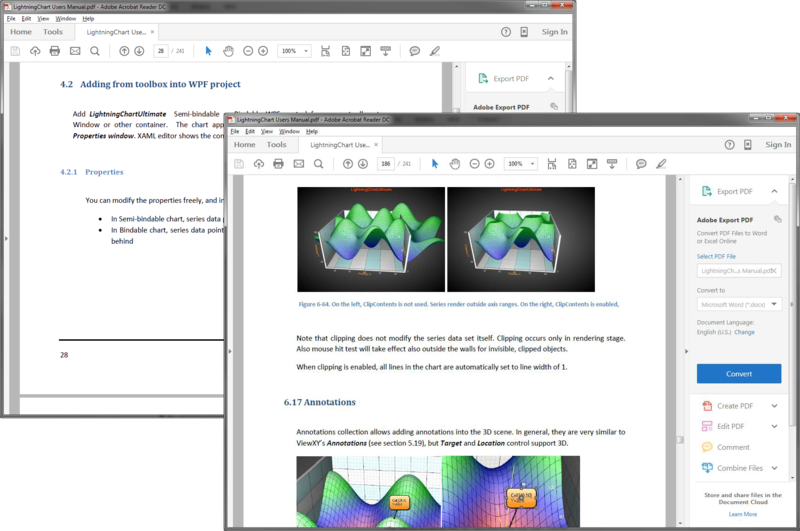 Modify the examples, rebuilt them, and experiment. If you have any questions, please contact our technical support team.